Iraqi soldiers wearing gas masks hold precursors used to make chemical weapons. The Iraqi military announced today that it arrested five members of an al Qaeda cell that was seeking to manufacture chemical weapons, including sarin nerve gas, and plotting to conduct attacks within Iraq, Europe, and North America. The Defense Ministry announced that it arrested the five members of the al Qaeda in Iraq cell and raided two factories in Baghdad that were used to research and manufacture the deadly chemical agents. The arrests were made with the help of undisclosed foreign intelligence services. 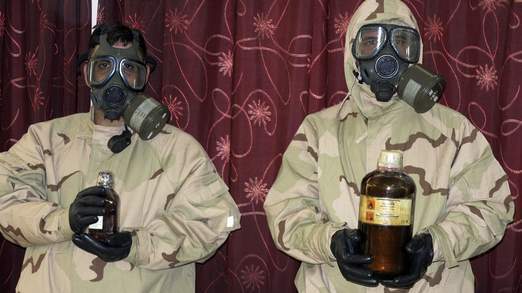 The chemical weapons cell was seeking to produce sarin as well as mustard blistering agents. The group had acquired some of the precursor chemicals as well as the formulas needed to manufacture the agents. According to the Defense Ministry’s spokesman, the cell was plotting to use remotely-piloted model aircraft to spray some of the chemical weapons sometime next week as Shia mourners commemorated the death of Imam Kadhum. The cell also had contacts with a network that would have attempted to smuggle the chemical weapons for use in the United States, Canada, and Europe, the Defense Ministry said. The report of an al Qaeda cell in possession of chemical agents is the second from the Middle East in the past two days. Yesterday, Turkish newspapers reported that members of an Al Nusrah Front cell were in possession of sarin gas, and were planning to conduct attacks at the Incirlik Air Base in Adana, and in Gaziantep, a city near Turkey’s border with Syria. Other reports said that the Al Nusrah Front cell was planning to use the deadly nerve gas inside Syria. The reports have not been confirmed by the Turkish government. The Al Nusrah Front for the People in the Levant is al Qaeda’s affiliate in Syria. The group was formed by al Qaeda in Iraq, and its leader has openly sworn allegiance to Ayman al Zawahiri, al Qaeda’s emir. The Al Nusrah Front is one of al Qaeda’s most dangerous affiliates. More that 10,000 fighters are estimated to be in its ranks, and the group is said to be absorbing entire units from the so-called secular Free Syrian Army. Al Qaeda in Iraq has attempted to construct crude chemical weapons in the past, and has employed such weapons on the battlefield. In 2007, al Qaeda in Iraq launched more than a dozen chlorine suicide bomb attacks in Baghdad, Anbar province, and Diyala province. The chlorine gas strikes killed 32 Iraqis and poisoned over 600 more. In Syria, the Al Nusrah Front is suspected of launching a chlorine gas attack in March of this year. Twenty-six Syrians, including 16 Syrian soldiers, were killed in the attack. Al Qaeda has long sought to place chemical weapons in its arsenal. In 2002, CNN found videos of al Qaeda experimenting with chemical weapons at the Darunta camp near the city of Jalalabad in Nangarhar province, Afghanistan. The video showed al Qaeda members experimenting with a gas thought to be sarin or another nerve agent on dogs. Formulas to make sarin were also found at the camp. In the ongoing ISLAMIC CIVIL WAR between Hezbollah Shia and al Qaeda Sunni being played out in Qusair and throughout the region, are there ANY drawbacks to funneling ALL our money and heavy weaponry to al Qaeda? I’m not a big fan of al Qaeda. We need to rethink our approach to this ISLAMIC CIVIL WAR. We can unsafely say that the chemical genie is out of the bottle. Is there a way we could get an analysis on the larger trend of violence in Iraq? It unfortunately seems to have increased in recent weeks. “The group had acquired some of the precursor chemicals as well as the formulas” yet were “plotting to use remotely-piloted model aircraft to spray some of the chemical weapons sometime next week as Shia mourners commemorated the death of Imam Kadhum” but don’t seem to have decided which weapon to use – Sarin (could be effective) or mustard gas (useless in model plane quantities). Next week seems too soon too, if they hadn’t yet produced any product from a tricky chemical reaction. Why hide the suspects faces, as in the al-Jazeera article ? The chemical glassware looks like random dirty old chemistry equipment, not material for quantity manufacture of anything. I’m no expert, I’m just suspicious. Could this potentially be connected to the recent arrests of al-Nusra members in Turkey? You know, the ones who allegedly had sarin elements? The reported al-Nusrah chlorine attack and fatality numbers are implausible. Chlorine has not been used since WWI and Syria has no known chlorine stocks. Second, hundreds of tons (or tens of thousands of shells) are required to produce a small number of fatalities – typically, a two per cent fatality rate was achieved in WWI. The claims for the 2007 ‘chlorine bombs’ in Iraq are also exaggerated, incidentally. If these weapons are used in Boston would that be crossing a red line? Chlorine was the original poison gas. Normal airflow along the Western Front was from west to east; Germany had to wait for the reverse. Then specialist troops released massive volumes of chlorine during a quiet time. They blew it. Instead of listening to their chemists (Haber) they did not back their gambit with any serious military action. As a visible, heavy gas, chlorine flowed forth like a science fiction monster — pooling heavily in the sea of craters. It also sunk down and in to ALL of the ‘safe’ hides used by the defenders. Rather than crawl up to the exposed surface, the men bugged out — taking large numbers of injured men with them. Chlorine demonstrated that it could entirely displace the defense — and that it could inflict massive injuries — without fatalities — mostly. It was so irritating that in open spaces every man would run away from it before ever receiving a lethal dose. It was rapidly phased out as a war agent because newer agents figured to be much more effective. While Syria almost certainly has not weaponized chlorine gas… every nation on Earth has it stockpiled or makes it. It’s a primary chemical used everywhere in industrial chemistry. For the Iraqi fanatics, the utility of chlorine was not that it would kill — it was that it would cause a complete panic. In doing so, it would be an apex terror agent. Eventually, everyone would figure out that merely running away, climbing to higher levels, and rinsing with water largely ruin the effect of chlorine gas. It’s so irritating that few ever inhale a lethal dose. Of course, if you’re knocked out by a blast, that’s a different matter. It’s this ‘easy treatment’ that caused militaries to shift to r e a l y nasty brews — of which the real horror was created. The purpose of the insurgents’ chlorine gas attack was to attribute the primary destructive act. Was the dispersement of chlorine the actual causative factor resulting in 30 KIA/600 wounded? Probably not. But was the actual bomb(s) detonation and fragmentation responsible for these aforementioned numbers? My experience says yes.